Our management training courses are focused on enabling you to improve your skills and meet the challenges of your latest managerial role. When stepping up to a new role, management training will help you to feel comfortable in your role and enable you to make a real and measurable difference to your performance in your new role. We recognise that a traditional approach to training courses isn’t going to be right for everyone, which is why all of our courses can be tailored and run on a 1-2-1 or group basis. We will work with you to fully understand your needs in order to deliver a practical training programme that will give incredible results. These management training courses are focused on ensuring that we make you a better manager and leader. Both management and leadership are practical learned skills, and so these courses are practical, hands-on training courses. They involve role play to ensure that you can practice the leadership techniques that we describe in the training course. We will explain the theory and background to the skills that we teach you but we will then move the class to practical exercises to ensure that that knowledge is put into practice. This both develops practical skills that can be used on your return to the workplace and also helps to ensure that the underlying theory and knowledge is retained. We use a variety of role plays and other scenarios to ensure that you practice the leadership skills you are learning as the training course progresses. Being able to manage and lead is an increasingly important career skill as people become more senior in organisations. It has been argued that the success of organisations rests as much on the quality of its management and leadership as it does on the quality of its product or other factors. What is management? What is leadership? What is the difference? Managers are responsible for making sure that things get done properly. Being a great manager requires you to have a broad set of skills which span planning, goal setting, motivation, delegation and team building. Management coordinates the efforts of people to accomplish goals making the best use of the resources available. Leaders are responsible for setting the overall director of a group of people or an organisation. Being a great leader requires a board set of skills which span strategy and planning, innovation, problem solving and communication. A leader set the vision and overall direction for a group of people and, very importantly, motivates and inspires a group of people to work towards that vision. In doing so a great leader will act as a coach and mentor and also, as a manager to ensure that their vision is delivered. Our main training centre is in Guildford . 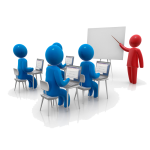 We also run managment courses in London, Reading and Basingstoke on request. We are also very happy to provide on site Access training courses at your premises. Harvard Business Review: What Great Managers Do?